Author Justin D’Ath lost his home in Victoria’s Black Saturday bushfires, and the story of that harrowing day forms the basis for his new novel, 47 Degrees. The morning of 7 February 2009 sees 12-year-old Zeelie Royle helping her father put the family’s ‘stay and defend’ bushfire plan into action as her mother and younger brother make an emergency trip into Melbourne. Animal-loving Zeelie listens anxiously to the news as the mercury rises, but with blue skies above her and no mention of her small town on the radio it seems impossible that the fire will reach them. But then the wind changes, and soon Zeelie and her father find themselves running for their lives as the world burns around them. 47 Degrees is an extraordinarily fast-paced and visceral story that plays out almost in real time, perfectly capturing the feel of encroaching disaster as the day develops. D’Ath’s personal experience lends the narrative an incredible authenticity from the oppressive heat of the day to the hot brown wind and the sting of smoke in the air. 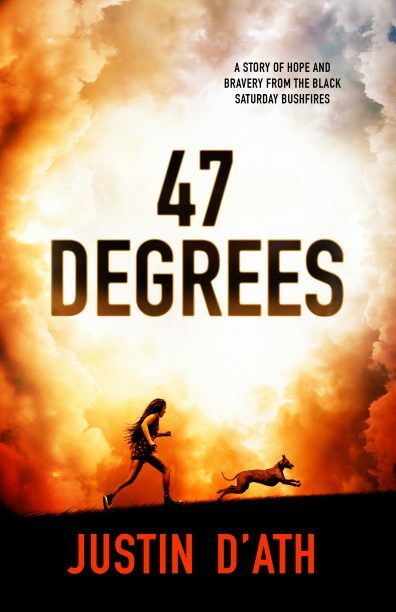 An action-adventure that rings with truth, 47 Degrees is also a story about courage, empathy, the importance of family and communities, and how the worst times can bring out the best in people. A fantastic read for ages 10 and up.